Can Caldwell unlock the enigma who is Nick Powell? In the 66th minute of a deadlocked game on Saturday, Stephen Warnock launched a superb cross into the Burton penalty box. Wigan’s number 25 made a run from midfield, ahead of a defender, dived in and headed it with power. Sadly for Latics the ball was to flash narrowly wide of the post. It had looked a certain goal. Nick Powell had got himself into a great position and almost delivered the goods. It was not the worst miss we will see this season, but it was to open up a debate as to which Powell we are seeing right now. Would the dynamic young player who thrived under Owen Coyle have put the ball in the net? Or were we seeing the one who floundered under Uwe Rosler? Three years ago to this month Powell starred in a Europa League victory over Maribor. His first goal had come after 22 minutes: a simple header into an empty net after the Slovenian goalkeeper had made a hash of a punch. Ben Watson added another 12 minutes later, but Maribor clawed their way back into the game as Latics went flat, scoring after 61 minutes. Powell’s deciding goal came in the 91st minute when he somehow found the energy that most of his teammates did not have to slalom through the visitor’s defence and score with style. Powell’s stock was high. His name was being touted around the media as the one who could go back to Old Trafford and lift his parent club out of their lethargy. He had become a key player in Coyle’s squad. Given the number of games Latics were facing the manager was operating a rotation policy but Powell seemed to be the one Latics forward who could go the full 90 minutes on a regular basis. It prompted fans to wonder about the fitness levels of his team mates. Following Coyle’s departure, Powell started in both of Graham Barrow’s games in charge, but was substituted early in the second half. He was pulled off after 65 minutes in Uwe Rosler’s first game, a 2-1 defeat at Maribor. However, in the next match he came back to play the full ninety against Bolton, scoring with a spectacular bicycle kick in Latics’ 3-2 win.He went on to score in the 2-1 win at Reading in the next match, but was taken off at half time. Around that time in late December media speculation over Powell’s future was going haywire. Whether it was due to the media hype or to a series of niggling injuries, Powell could not recapture his early season form. What was visible to the fans was a Powell not showing the same kind of physical commitment that they had seen earlier in the season. Moreover the swagger that the young player was showing in his body language earlier in the season that had been seen as a sign of self-belief, was now being interpreted by some as a “couldn’t care less” attitude. Powell went back to Manchester United when his loan expired in the summer of 2014. He started in the United team that lost 4-0 to the MK Dons in the League Cup, being taken off after 57 minutes. Within a week he had joined Leicester City on loan, but had to be content with just three appearances off the bench. His loan spell was cut short at the end of December with Leicester citing a lack of commitment to training. On his return to Old Trafford he was to be out for nine months with a hamstring injury. In December 2015 he came on as a 69th minute substitute for United in a Champions League defeat at Wolfsburg. A week later he came off the bench after 74 minutes in a 2-1 reverse at Bournemouth. In early February 2016 Powell joined Hull City on loan, making his debut in a goalless draw with Arsenal in the FA Cup, being withdrawn after 78 minutes. He was to go on to make three Premier League appearances off the bench before completing a full 90 minutes in a 4-0 FA Cup defeat by Arsenal. 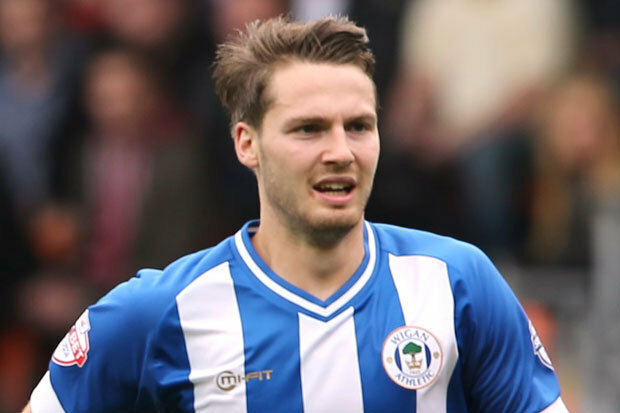 In the two years between leaving Wigan and returning, Nick Powell made a starting lineup 4 times, completing the full 90 minutes-plus just once. He made 8 appearances off the bench. Can he put this nightmare time behind him? Gary Caldwell stuck his neck out in summer by signing Powell, given his form over the past two and a half seasons. Moreover the 22 year old is surely going to be on a salary above most of his teammates. Why did Caldwell take such a gamble? Can Powell get back to full fitness and the kind of form he showed three years ago? Powell’s best times at Wigan were when he was playing as a central striker. However, Caldwell has been playing the Crewe-born player in his preferred role in midfield. Up to this point he has started 5 times with 5 appearances off the bench. His best performance up to this point was in his first appearance against Blackburn Rovers, where he scored from a free kick and had a good all-round game. Although he has not been able to keep up his form of the Blackburn match, he has completed the full 90 minutes in three games. Given the player’s injury problems over the past couple of years it is a step in the right direction. Caldwell clearly has faith in this talented player who had lost his way. Can the Scot nurture Powell back to the match sharpness that will make him the threat to opposition defences that we saw under Owen Coyle? In recent matches Powell has alternated with Jordi Gomez for the “number 10 role” behind the centre forward. Gomez too has been some way short of full match fitness after so little involvement in Sunderland’s pre-season. Both have the capability of controlling the flow of midfield play, together with potent goalscoring prowess. Should both Powell and Gomez reach peak fitness, Caldwell will surely have a selection problem on his hands. There is a strong argument to suggest that there is not room in the midfield for the two of them. Each needs a good share of the ball to function. However, Powell can also play as a central striker, although Latics now have three others in Craig Davies, Will Grigg and Adam Le Fondre. However, the reality at this moment in time is that Nick Powell has just started back on the road towards recuperating his football career. Should he manage to shake off those injury problems that have bugged him for too long he will also have to recover the kind of self-belief that he had as a 19 year old in the Coyle era. Powell is certainly a high profile player at Wigan, but a real enigma. Can Caldwell unlock the enigma in a way that no manager has done over the last couple of years? Like all players Powell has his supporters and his critics. In this same month three years ago the former surely outnumbered the latter. But since then a downturn in form has turned around fan opinion of him. There is a long road ahead for Nick Powell in his bid to regenerate himself as a footballer. Let’s hope that in the months ahead that we will see his swagger as a manifestation of the levels of self-belief that he showed as a 19 year old.